The article includes several nice examples of effective slide presentations. Al Gore uses slides with wonderful visual images—a mix of charts, photographs, and videos—to illustrate his talk on the environment. Steve Jobs uses slides “creating something closer to a movie than a slide show” in his talk unveiling the iPhone. Both keep the use of text to a bare minimum, and instead they use visual images that illustrate their words, and it makes their presentations much more interesting. The article uses a presentation by Harvard law professor Lawrence Lessig to illustrate that slide software can make impenetrable subjects mesmerizing. It is worth looking at because it is very different from the other examples. He is illustrating a talk about the Google book search lawsuit—which is more like many of our presentations than the other examples. I was glad to see this article because I don’t want to end this series on PowerPoint on a negative note (this is the end, I promise). I will continue to use PowerPoint in my presentations, and I hope to use it more effectively. Dale Roenigk has offered to pull together some informal sessions so that we can share ideas. I look forward to those sessions and to learning from all of you. The times when I have found Power Point presentations useful has been when the user did something similar to Steve Jobs in “creating something closer to a movie than a slide show” . When I have been the user, it has proven to be most helpful for audiences when there was data I wanted to portray throughout my talking. For example, I could leave a chart up for several minutes while I spoke instead of having a slide for each portion of the talk. 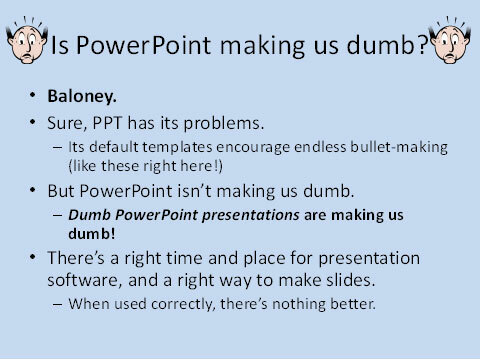 I don’t agree that Power Point is making us dumber but I believe that it has made many of us lazy in interacting and connecting with the audience. I see its use similar to that of make-up: it’s intent is to enhance not to substitute! I admittedly came late to this powerpoint blog discussion party…where do you all get your time? It’s been interesting reading Mike’s posts, the comments, and following the many links shared. I like the Slate.com article that Jill M. shared and tend to subscribe to the it’s-just-a-tool philosophy (giving me a hammer, doesn’t make me a good builder, any more than conferring a degree on any of us make us a good teacher, or handing us a mic make us a good communicator). All the best presentation examples were created with the same presentation tools that created the poor examples. I wouldn’t have likely read (or continued reading) Ann McColl’s constitutional tales articles, but I *did* find her superb, well-rehearsed and content-heavy, presentations to be very engaging and instructive…and left me wanting more. I’ve been to some to some presentations in the school where eliminating powerpoint alone would be a mistake. Replacing it with a group activity, or Turningpoint activity would probably have helped, but I echo (and extend) advice from Richard W. that slides should support specific learning objectives and if we’re not clear on those, well, a review of those may be in order–If our slides are overloaded, we just simply may be trying to convey too much stuff. So, as I see it, *WE* …and the *TOPIC* to a lesser extent are the primary variables in the equation. Most tools, however, do suggest ways to use them and hint at inherent affordances. For example, sliderocket.com, prezi.com and voicethread.com… and for that matter, rooms 2601, 2401 and 1300 all suggest quite varied methods of communication. It is from example, precedent and our peers that we often take our cues. We need to more consistently be seeing good examples. To that end, I like Dale R.’s suggestion that we set a (regular?) time to get together to share examples and lessons learned…Berating poor presentations, and inappropriately applied tools is easy. Improving our own is hard. TLS already has available for checkout 3 great resources (books) “Beyond Bullet Points”, “Slide:ology” and “Presentation Zenn”–my fav). Caution: Improvement takes work, practice and feedback. Lest you think you’ll change by reading a book or having someone tell you how to make a good presentation. We do so many presentations in the building, its probably a good idea we spend more time improving our craft. Thanks Mike (and originally Maureen Burner) for bringing this to the fore. I motion to make Mike our newest TLS blog contributor.